Swaziland, a small landlocked country in Southern Africa bordered by South Africa and Mozambique has a total land area of 6,704 square miles and a population of around 1.2 million. Swaziland is a beautiful country with very diverse terrain which includes mountains, rainforests, savannah, highvelds, lowvelds, escarpments, canyons and rivers. The major sectors of its economy are services, agriculture, manufacturing, and forestry. Around three-quarters of its population is engaged in subsistence farming. Poverty and HIV epidemic is threatening the country’s future. The government has initiated efforts to provide a positive environment for foreign investment. In keeping with that the tourism options are also growing. June through September is the best time to visit Swaziland. Game viewing is best in summer when the vegetation is at its thinnest. Hlane, Mkhaya, Malolotja, and Milwane are the majestic nature reserves with Mkhaya offering a better chance to view the rare black rhino. Both bird watching and big game viewing is popular among visitors. Their Reed Dance is a vibrant display of traditional African culture. 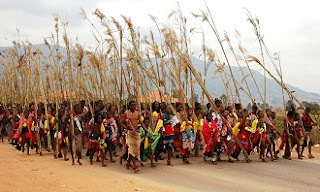 The Reed Dance held in August /September and the Incwala in January are crowd pullers. Swaziland: A Southbound Pocket Guide 978-1920143275 $10 The best available guide book for Swaziland! A short introduction of Swaziland covering 30 pages followed by a brief history of Swaziland covering 100 pages and the rest of the book features a region-wise travel guide. South Africa (including Lesotho and Swaziland) Travel Map 978-1553414063 $13 1:1.5M Scale. The first stamps of Swaziland were a set of eight stamps released in 1889 which were ‘Swaziland’ overprints on stamps in the Coat of Arms theme. The set (Scott #1 to #8) is very rare and catalogs for around $6K mint and around $4.5K used. Stamps of Transvaal were used in Swaziland during the period from 1890 to 1933. The area was administered by Transvaal from 1894 to 1906 when the administration came under the British High Commissioner for South Africa. Swaziland released a set of ten stamps on January 2, 1933 showing King George V (KGV) in different colors and denominations. The set (Scott #10 to #19) catalogs for around $150 mint and around $220 used. Common Design Types of the Silver Jubilee issue and the Coronation issue formed the stamp issues of Swaziland during the period till 1938. Swaziland released a set of eleven stamps on April 1, 1938 showing a head portrait of King George VI (KGVI) in different colors and denominations. The set (Scott #27 to #37) catalogs for around $55 MNH and around $35 used. Swaziland also released a set of three stamps on December 3, 1945 to mark the Allied victory in World War II. They were ‘Swaziland’ overprints on South Africa issues #100 through #102. The set is inexpensive and catalogs less than two dollars MNH and around $5 used. A set of twelve stamps released on July 2, 1956 showing Queen Elizabeth II (QEII) and local scenes. The set (Scott #55 to #66) catalogs for around $70 MNH and around $45 used. The designs show asbestos mine, married woman, Highveld View, courting couple, warrior, and Kudu. A set of fifteen stamps released on August 1, 1969 showing Fauna. The set (Scott #160 to #174) catalogs for around $25 MNH and around $30 used. The designs show African lynx (caracal), Cape porcupine, crocodile, lion, African elephants, bush pig, impalas, Chacma baboon, honey badger, leopard, brindled gnu, white rhinoceros, Burchell’s zebra, waterbuck, and giraffe. A set of four stamps released on July 1, 1987 in the World Wildlife Fund (WWF) theme. The set (Scott #519 to #522) catalogs for around $25 MNH and around half that for used. The pictures show white rhinoceros in different designs. Swaziland’s main trading partner is South Africa and its currency is pegged to the South African rand. Swaziland’s growth and social integrity is endangered due to the HIV epidemic which is devastating the country’s population – life expectancy in Swaziland is just 32 years, 6 years lower than the next lowest average of Angola and less than half the global life expectancy of 69.4. The first coins of Swaziland were Kingdom Standard Coinage (100 Cents = 1 Luhlanga, 25 Luhlanga = 1 Lilangeni) Silver Cent Proofs released in 1968. Gold Proofs were introduced the same year with the release of 0.9170 troy ounce Lilangenis in the independence theme showing Sobhuza II in Obverse and Arms with Supporters in Reverse. The issue has mintage of 2K can catalogs for a slight premium over bullion value. Decimal Coinage (100 Cents = 1 Lilangeni) debut in 1974 wit the release of Bronze Cents. The first issues have very high mintage and catalogs for well under a dollar. Coins $2 and up Common UNC Cents from the 1980s onward starts around $2. Large Commemorative Proofs, UNC Coin Sets, etc start around $10. Silver Proofs from the 1960s onward, Year Sets in Original Box, etc start around $50. Silver Proof Sets from the 1960s, Gold Proofs, etc go well into the 100s. Paper Money $3 and up Common UNCs starts around $3. Early Decimal Coinage UNCs starts around $10. UNC Specimens, High Value Commemoratives, etc start around $30. Very Low Serial Numbers, Consecutive Serial Numbers with 10-pieces or more, UNC Bundles, etc start around $50 and go well into the 100s. Wooden sculpture, soapstone carvings, grass weaving (mats, baskets), pottery, and colorful batiks are the typical souvenirs. Miscellaneous Collectibles $3 and up Patches, Stickers, Simba Beer Cans, Flags etc start around $3. Rough Steftonite (Bloodstone) samples start around $50. Sawazi Tribal Baskets with artwork start around $100.